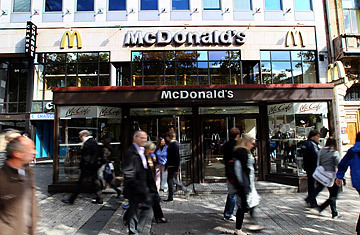 People walk past a McDonald's restaurant on September 25, 2010 at the Champs-Elysees Avenue in Paris. This post is in partnership with Worldcrunch, a new global-news site that translates stories of note in foreign languages into English. The article below was originally published in Le Figaro. France is world famous for its haute cuisine and super-fresh and crunchy daily bread, the baguette. A lesser known feeding feature is that the country also happens to be the world's No. 2 consumer of McDonald's. Alors! Prepare yourselves for a small revolution in the world of both fresh bread and fast food, with the introduction of the baguette on the McDonald's menu in France. For starters, in September, French clients will be able to enjoy a French-style breakfast with fresh bread and butter and jam in the chain's 130 McCafés (separate counters offering coffee, pastries and buns.) In 2012, McDonald's will take the experience further by offering a baguette sandwich. This might be tough competition for local bakeries, especially because of McDonald's low-price policy. The senior Vice President of McDonald's France and Southern Europe Nawfal Trabelsi explains that "during the first 15 years after McDonald's arrived in France in 1980, its objective was to export its original model and offer a little piece of America. Today we are part of French people's everyday life. Our priority is to integrate ourselves locally and to give a French touch to our original offer of hamburgers and ice cream. "The French love the baguette. We are just progressively responding to a natural demand." Indeed, even despite the surprising success of McDonald's in France (only the U.S. consumes more), the French still eat nine times more sandwiches than hamburgers and 60% of these sandwiches are made with baguette bread. The favorite is the traditional ham and butter sandwich. McDonald's will bake the new French bread on the spot. Breakfast represents less than 1% of McDonald's sales in France. With this new offer, its aim is to boost its breakfast sales while improving its image. The arrival of the baguette at McDonald's represents another step in its efforts to answer the very special French food habits and to work more and more with local producers. The bread will be provided by the French company Groupe Holder which already provides the pastries for McCafé. The butter will come from the French cooperative of Isigny and the jam from a traditional producer from the Pyrenees. Elsewhere around the world, McDonald's is also trying to capture local flavors from the Churrasco sandwhich in Chile to a Teriyaki burger in Japan. In January, McDonald's launched the McCantal, with the renowned cheese from south-central France, and in February the Charolais made with famous French Charolais ground beef. All that's left: McEscargot!? Massive Crowds And Crumbling Monuments, Has Venice Reached A Breaking Point? See why McDonald's is now offering weddings. See how McDonald's is redesigning itself to compete with Starbucks.